What a fantastic couple to work with! We were presented with the challenges of needing more outdoor living space, a place to rinse after long bike rides, and an area for the young couples newest addition to play. We did it! We doubled the outdoor living space, added an outdoor shower just off the new patio, and managed to use the shape of the yard to our advantage to create an easy flow and accessibility to the yard! 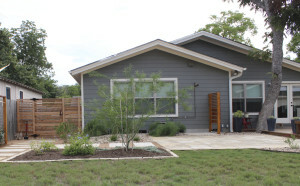 We were left with a new landscape that fit this young couples awesome style of a modern-craftsman infusion!